Welcome to the CARMAH Kino! Join us in the IfEE Medialab every other week to watch and discuss films relating to museums and heritage. Should you have any questions, or suggestions for films you would like to see programmed, please contact Debbie Onuoha. For our first session of the 2019 summer semester, we will be watching two films about the fate of political monuments in post-Soviet states. 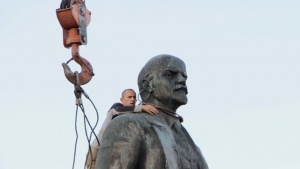 The Fall of Lenin. Svitlana Symko. For our second session we will continue with the theme of the dissassembly of monuments, by looking at the destruction of cultural heritage as a form of political warfare in conflict zones. The purposeful demolishment of buildings, books and art as part of war has wrought catastrophic results on every continent. Leading up to the destruction of historical cities such as Aleppo and Homs in Syria, this deep investigation spans over a period of more than 100 years. We take a close look at the devastation of cultural, religious and historical heritage as a means to erase collective memory and identity and gain new insight into how such crimes against humanity have been combatted in international politics. Following the screening, director Tim Slade will join us for a Q&A over skype. From Brazil, our third film of the semester blends past, present and future in an experimental exploration of how to deal with contentious histories. Our fourth session of the semester is a collection of short films. Each reenvisions natural history in spaces such as museums, botanical gardens and forests. Our fifth session is a double-bill on colonial histories in Belgium’s Africa Museum. Filmmaker Matthias de Groof will join us for a Q&A session after the screenings! For our sixth and final session of the semester, we explore controversies about the vandalism and restoration of art in the Netherlands. Filmmaker Barbara Visser will join us for a Q&A following the screening of the film. In 1986, a man entered the Stedelijk Museum Amsterdam and slashed the painting Who’s Afraid of Red Yellow and Blue with a utility knife, supposedly, in response to the abstract nature of the work. A controversial restoration and court case followed. The End of Fear unravels the bizarre history of the destruction and restoration of ‘Who’s Afraid of Red Yellow and Blue III’ by Barnett Newmann. Visual artist and filmmaker Barbara Visser revisits the very public destruction, restoration and court case of this iconic painting.